Join us at our new Innovation Center for a professional training with acclaimed pastry chef, En-Ming Hsu. 9,000 square feet of space designed to showcase Selmi Chocolate Equipment, Flow Wrappers from TLM, and industrial melting tanks from MCM Massa. Schedule your visit with us today. Horizontal and vertical flow wrapping machines are onsite at Tomric’s innovation center. Let us help you find the right machine for your needs. We help our customers work more efficiently and achieve their professional chocolate making goals. Our line of Selmi chocolate making equipment is widely regarded as the best in the world, and we offer the widest selection of chocolate molds in North America. Our in-house culinary team is available to train and educate our customers on the use of our products. 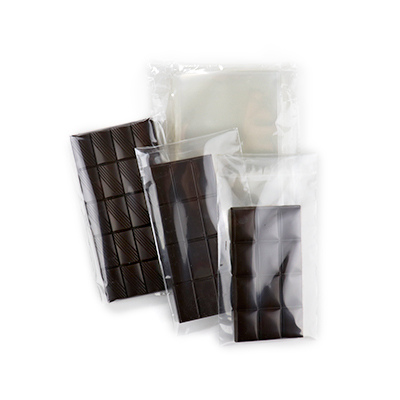 We began by making high quality polycarbonate chocolate molds in 1962. Over the years, we’ve evolved into being the pioneer in the design, manufacture, distribution, and sale of chocolate molds, equipment, packaging, tools, and utensils. We deliver complete systems to the confectionery and baking industries at all levels worldwide. Our goal is to become the industry’s single-source solution for both large scale producers and professional chocolatiers. Discover how Selmi Chocolate Equipment – widely regarded as the finest in the world – will help you become more efficient, productive, and profitable. Need to make chocolate bars with a logo, phrase, or artwork? Our “Quick Ship” Custom Bar program can get you the molds you need right away – as well as corresponding packaging. Working with chocolatiers and bakers around the world, we know how to design plastic trays to fit your brand, protect your product, and help you control cost.